Mechanization of ground forces first came about during the 1st World War with the introduction of an armoured tracked vehicle fielding a large bore cannon, by England. This vehicle was dubbed "Tank" by Winston Churchill, and the innovation has altered the conduct of warfare to this day. During the second conflict, the mechanization of Infantry was perfected by the Germans and brought about the name Blitzkrieg. During that conflict over 3 million military vehicles were produced, and even thought the tank had considerable advantages, the need for a method of having the Infantry keep pace with them became a necessity. After the war, many countries modified existing armoured personnel carriers for modern usage. The M113, which was first fielded in 1964, was a low budget, trouble free masterpiece and widely used throughout the globe. The United States needed a "fight from within" mechanized Infantry Combat Vehicle and research started in 1967 for a vehicle to meet this purpose. With the greater speed and mobility of the M1 Abrams MBT new requirements were levied that the IFV and CFV must be able to keep up and support the MBT's. The FMC Corporation of San Jose, Califoria won the bidding competition and the M2/3's came into being. 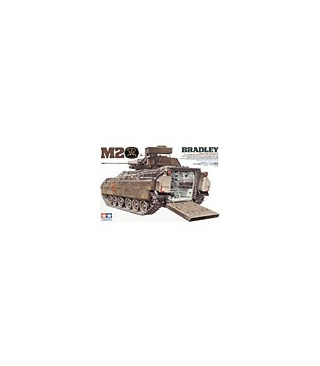 Dubbed the Bradley in honor of Omar N. Bradley, a five star general of World War 2 fame, the M2/3 series offer the sought after flexibility in a true "fight from within" concept. The M2 Infantry Fighting Vehicle differs from the M3 in the addition of six external firing ports to handle the M231 FPW's which can be operated by the six, fully equipped infantrymen carried within. Manned by a crew of three, the M2 IFV mounts a Hughes 25mm M242 chain-gun and a coaxially mounted 7.62 machine gun, housed in an offset turret which can traverse 360 degrees. With a maximum elevation angle of 60 degrees, the cannon provides aircraft and helicopter protection. A thermic ray visioning fire control system allows accurate firing even when traversing rough field conditions, day or night. A TOW anti-tank missile system also complements the defensive capabilities of the Bradley. With a speed of 66km/h on road capability, the M2 IFV is truely a formidable weapons system.